« Don’t Mess With Texas! Temperatures in the 80s with chances of showers almost every day through next Friday. Best chances today are this evening. Still looks like next Tuesday and Wednesday are the strongest chances for showers. Overcast off and on today, but so far. no moisture. We are still seeing no generation in the mornings with a unit coming on atound 1:00 p.m. Projections for Sunday is a low one unit. Monday it will be off almost all day and Tuesday will go back to the no units until early afternoon. Travis and Katie from Michigan fished with Jim Wednesday. Good day for these two on the CQ, copper dun midge and blood worm. Fortunately, they got off the water before the generators came on. Carolyn had Joan, from Kansas out all day. 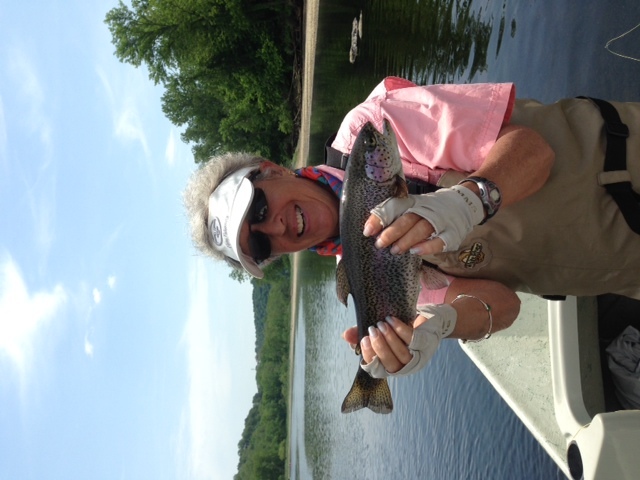 Very good day for Joan on the black copperhead and copper dun midges. On came one unit, so we broke for lunch. Cleared up and we proceeded to catch some more fish and then the second unit came on. Well that was it for the day. You would not drift over five feet before junk was all over the flies. Bummer! 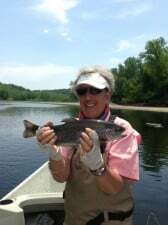 Thursday, Barry and Kristy from Oklahoma fished with Carolyn. They started fishing Taneycomo about one year ago and wanted some pointers on how to fish it. Hopefully, we accomplished this. 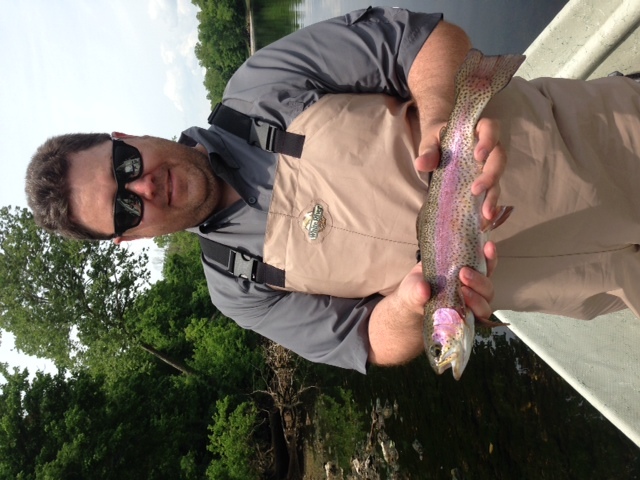 Couple different techniques, different places to fish, worked on presentation, a little casting work, and a pretty good catching day…..that is until a unit came on. Fortunately, we were just about ready to wrap up the day. 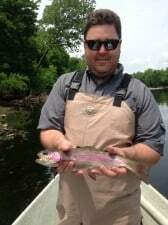 This entry was posted on Saturday, May 24th, 2014 at 1:55 pm	and is filed under Fishing Reports. You can follow any responses to this entry through the RSS 2.0 feed. You can leave a response, or trackback from your own site.